Christopher Dyer started cooking in the home with his mother and father as a child. Cooking different food from around the world. He is a highly motivated and a hands-on manager with over 9 years of hospitality management and culinary experience. His way of being detail-oriented and the way he can adept at managing multiple projects simultaneously makes him an excellent leader with commitment to provide clients with exceptional results. Chris started his cooking career at Djons in Melbourne beach Florida cooking with the local sea food. Then moved to Orlando and worked at the Waldorf Astoria. 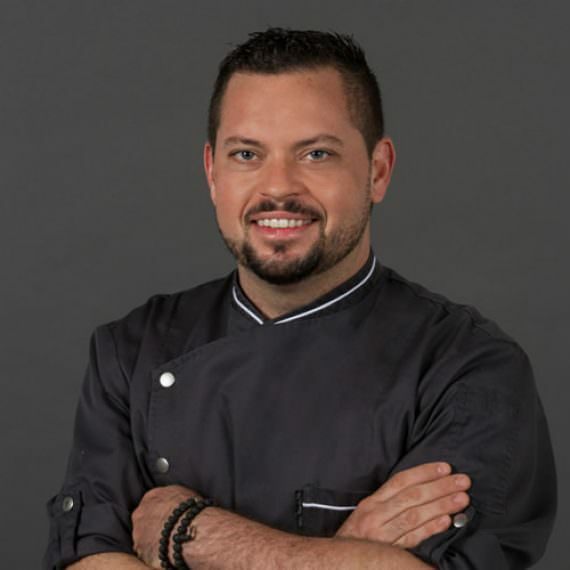 After working at the Bull and Bear he then opened High Highball and Harvest Ritz Carlton Orlando where he learned southern style food using great local ingredients. Chris then moved to Banquets at the JW Marriott Grand Lakes where he learned how to work large parties. After learning how to work in a large kitchen Chris then wanted to get back into working in restaurants and moved to Marco Island to run different restaurants and still be a part of the banquet team. In his off time Chris likes to spend as much time as he can with his family outside. When Chris has time at home his wife Katya, son Ruslan and daughter Vivian love to take him on bike rides and spend time playing outdoors.